In Bangladesh the practice of English literature is becoming popular. Rather than only writing in Bangla, many writers are deciding to write in English. It is a new trend in Bangladesh. The English writers in Dhaka will be meeting again at the second edition of Hay Festival. The festival will be held on 15-17 November 2012 in the historic grounds of the Bangla Academy, Dhaka. It is hoped that through this event the new generation of Bangladeshi writers in English will be promoted to the global literary community. 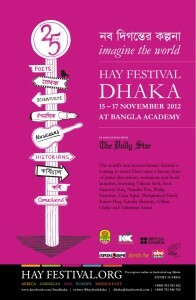 The poster of Hay Festival Dhaka. As an annual event, which we hope to build on, Hay Festival Dhaka is an excellent vehicle for our emerging community of English writers to be plugged into the global literary scene. We want to take our Bengali literature beyond our borders, as only a fraction of the huge repertoire of our Bengali writing has been translated or promoted abroad (whereas in comparison for example, South American writers are household names globally). We hope Hay festival will encourage publishers to take on translation projects. The Hay Festival presents a wonderful opportunity to create dialogue between leading British and Bangladeshi authors; I hope this event will herald a new wave of Bangladeshi writing as we bring some of the magic of Hay to Dhaka. 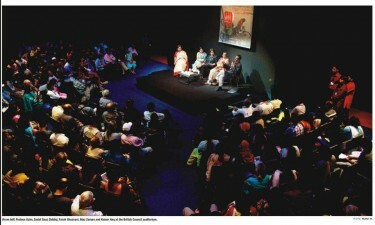 Here are some pictures from the 1st Hay Festival Dhaka held last year. 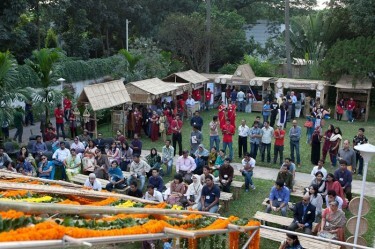 Images of Hay Festival Dhaka 2011. Pictures courtesy the Facebook page of Hay Festival Dhaka. This year’s festival will be a three-day literary feast of bilingual panel discussions and other events featuring internationally acclaimed authors like Vikram Seth, Syed Shamsul Haq, Nandita Das, Philip Hensher, Kamila Shamsie, Basharat Peer, Zafar Iqbal, Mohammed Hanif, Gillian Clarke, Kaiser Haq, Sharbari Ahmed, Farah Ghuznavi, Shaheen Akhtar, Selina Hussein, Shehan Karunatilaka, Mahmud Rahman, Anis Ahmed, Anisul Hoque, Audity Falguni, Tahmima Anam and others. Hay festival for literature and the Arts was started in a small town in Wales Hay-on Wye around a kitchen table in 1987, and it has now become one of the largest literary festivals of its kind in the world, set in spectacular Welsh countryside of the Brecon Beacons. Famously called ‘the Woodstock of the mind’ by Bill Clinton, Hay has brought together writers from around the world for 25 years, to debate and share stories. This year marks the 25th anniversary of Hay Festival and 10-day celebration on the occasion was held in June in Hay-on Wye in the UK.